Here is a look at my initial mock draft for the 2019 season broken down into four parts and starting with picks 1-8. Make sure to tune in soon for our ‘Mock Draft Podcast’ edition of Ourlads’ Guide to the 2019 NFL Draft. Dan Shonka and I will go in-depth on every pick in the first round. Interestingly enough this is not a primary need, but the writing appears on the wall no matter what the team decides to do with Josh Rosen. OL - RT Marcus Gilbert should give the Cards a decent veteran option, but he’s only been signed on for one season and Will Holden hasn’t developed yet either. The Cards might also decide to let former first-round pick, LT DJ Humphries walk after 2019, considering he’s only started 27 of 64 games due to an assortment of injuries. And since the team will field a young QB either way, the Cards need to do a better job of protecting whoever ends up starting on opening day. DE - Terrell Suggs is coming back home where he played his high school and college ball, but he’s 36 and the depth is thin once you get behind Suggs and standout Chandler Jones. OLB - New coordinator Vance Joseph wants to use his base defense as much as possible, meaning he requires more quality talent at this position. Free-agent MLB Jordan Hicks is a great addition, but youth and athleticism is needed to field a better overall unit. CB - Signing Robert Alford was smart, but the Cards are relying on several below-average veterans to play significant snaps when they run the nickel. The signing of Dee Ford should have little impact on whether the Niners use their top pick on another premier edge-rusher. The only other realistic option based on their needs and draft position is to trade down and fix two positions from one deal. WR - Dante Pettis looks like a keeper and the addition of free-agent Jordan Matthews will help to add depth, but the Niners could really use another impact player here, specifically a player with good size. DE - San Francisco’s 37 sacks last year was their best mark since 2013, which happens to be the last time they advanced to the post-season. If they stick at No. 2, no other player best fits their needs than Bosa. DB - CB Ahkello Witherspoon did not develop as was expected last season while injuries forced eight different safety combinations. There is ample depth now after adding three players from last year’s draft and signing veteran FA CB Jason Verrett, but top-tier talent is still lacking. OL (OT) - LT Joe Staley will be 35 this season and is slated to become a free agent when it ends. He’s still playing at a high level, but age catches up to all of us and the Niners need to protect themselves as well as their prize investment, QB Jimmy Garoppolo. This pick should come down to two players and three possibilities. Either the Jets stay here and go with Allen to fix their pass rushing needs or DT Quinnen Williams can help them solve their interior defensive line needs. Or, they make the move they want to make and trade down to either Tampa Bay or New York to recover the extra picks needed to fill out several key spots on their roster. LB - CJ Mosley adds a culture changing player for the defense, but the Jets still need to find that elusive pass rusher they haven’t drafted since John Abraham in 2000. OL - All-Pro OG Kelechi Osemele was acquired from Oakland, but the Jets still need to add another center and tackle to the roster. If they trade down to acquire more draft capital including the second round pick they lost in the Sam Darnold trade last year, they should try and land the top center in this year’s class, Garrett Bradbury out of NC State. CB - Brian Poole was a good addition to replace the departed Buster Skrine, but the Jets need to find someone who can line up opposite from last year’s prized free agent, Trumaine Johnson. NT - The Jets have a huge hole to fill up-the-middle once you get past 33-year-old part-time player, Steve McClendon. WR - Robby Anderson, free-agent addition Jamison Crowder and a healthy Quincy Enunwa can form a solid enough trio, but the Jets don’t have a true No. 1. This position becomes a much bigger bet if they trade down from three. With four picks in the first 35 the Raiders will have a good chance to re-stock their roster. I feel pretty good about them adding an edge-rusher, running back and/or cornerback early in the process. DE - As soon as the Raiders traded Khalil Mack this position became a huge priority and is the clear top overall need. Good thing edge-rushers are available in spades this year. RB - Even if Marshawn Lynch returns for another season the Raiders need to think of the future and get themselves a young starting caliber performer. Free-agent Isaiah Crowell was a decent depth signing. CB - The Raiders already have some interesting options at this position who could ultimately play better than expected, but there are too many questions to pass on selecting at least one impact player here with one of their top four picks. Free-agent Nevin Lawson was signed for only one year to play the nickel while Carolina cast-off Daryl Worley has to prove himself for an entire season. And keep an eye on last year’s fourth-round pick, Nick Nelson. TE - Oakland allowed their leading receiver (Jared Cook) to leave via free agency to New Orleans and it was a decision I fully endorse. While he performed better in Oakland over these last two years than he did with at his previous two stops (Green Bay & St. Louis), he’s still a bit inconsistent and turns 32 this season. Not a good recipe for a rebuilding franchise. LG - With Kelechi Osemele traded to the Jets, the Raiders now have a big hole to fill here. With so many important needs to fill, it’s going to be hard to guess which direction the Bucs will go early, especially if both Murray and Haskins are off the board by time this pick comes around. If both are taken early, then Kentucky OLB Josh Allen should be available here and make his way to Tampa Bay. Each position listed below should be considered critical. QB - Even though I list this position as their top need, there’s a chance the Bucs will pin their hopes for one last season on Jameis Winston, especially with quarterback-guru Bruce Arians taking over. But no matter how much Arians talks him up, they would be crazy to pin their hopes on Winston and waste a shot at taking a talent like Haskins. This is the reason why if the Giants really want to draft Haskins too, they’d better move-up to get him. RG/RT – Caleb Benenoch was part of the problem up-front here last season and now he’s being moved outside to tackle. With RT Demar Dotson entering his contract year at 33, the Bucs should try and find two starters to take over on the right side of the line by no later than 2020. RB – The Bucs need a No. 1 rusher and they’ll have a good number of prospects to choose from starting with their second-round pick. WR - The Bucs have to replace two of their top three receivers and must add a top slot-player with Adam Humphries moving on to Tennessee. Humphries was also the team’s No. 1 punt returner. DB – The health of 2016 first-round pick, CB Vernon Hargreaves, is critical for the success of the backend. His last two seasons have ended on IR including a Week 1 shoulder injury last September. Since he can’t be counted on though, the Bucs need to find an insurance starter in the draft who at the very least will help their depth. If last year’s second-round pick, MJ Stewart, can make the full-time transition to safety, then Tampa Bay should be in good shape there along with Justin Evans. OLB - With the Bucs moving to a 3-4 under Todd Bowles, the team will need to look for an edge-rusher that best fits their new scheme. Maybe Noah Spence will finally that next step with the new staff, the new scheme and hopefully better health. 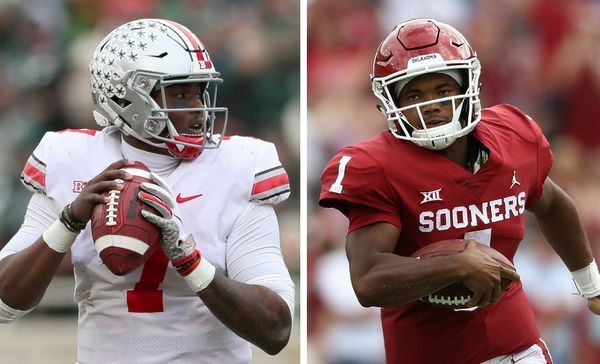 With several big needs to fill, the key question for the Giants will come down to whether or not they’ll do anything they can to draft QB Dwayne Haskins. If they decline to trade up and get him, look for the Giants to take care of their other important needs during this year’s draft and wait until a better crop of quarterbacks come out in next year’s. QB – In this yearly game of NFL Draft poker, it’s hard to tell what the Giants truly intend to do with their top pick. My guess is, if they don’t go after Haskins with the sixth pick, there’s a reasonable chance they won’t take one at No. 17 either. OLB - The Giants fell all the way to 30th in total sacks last season under 1st-year coordinator James Bettcher, who changed the scheme to a 3-4 alignment. So if the Giants don’t use their top pick on a quarterback, this has to be the position they turn to first. RT – Dave Gettleman has done a good job upgrading the talent on the offensive line so far. The deal to bring in RG Kevin Zeitler from the Browns was an excellent one. But one more position up-front must be addressed and it needs to be addressed early. CB – The Giants used a 2019 third-round pick in last year’s supplemental draft to select CB Sam Beal. Beal injured his shoulder on the first day of training camp and missed his rookie campaign. Whether Beal turns into a quality starter though is still a mystery, which is why the Giants have to add another top rotation corner to the unit, especially with starter BW Webb leaving for Cincinnati. Even though the Jags finally have their quarterback, they still have lots of holes to fill on the offensive side of the ball including the need to add more reliable playmakers. But if the chips fall the way my current draft board has, I can’t see Tom Coughlin passing on a player like this that falls on his lap at No. 7. The wild-card pick here is TE TJ Hockenson from Iowa. OL – The Jags struggled again in the trenches, especially following long-term injuries to LT Cam Robinson, C Brandon Linder, LG Andrew Norwell and fourth-round pick, RT Will Richardson. To this point the Jags have only re-signed RG AJ Cann. TE – With QB Nick Foles now running the show, the Jags need to add at least one top-tier tight-end to the roster. Last year in Philly, the Eagles’ Zach Ertz was targeted an amazing 156 times including 42 over the last five games under Foles. So don’t be surprised to see either of the Iowa standouts, Noah Fant or TJ Hockenson, get called a bit earlier than expected. RB – Leonard Fournette has been a major disappointment following injuries, tantrums and suspensions. No matter what is being said through the media to shine a positive light on the situation, the Jags need to use a high draft pick to add another starter to this room. DL – The Jags let DT Malik Jackson go in free agency and traded Dante Fowler Jr. to the Rams last October. With all of the depth at this position now available in this year’s draft class, the Jags should think hard about recouping some of that lost collateral. S – After cutting SS Barry Church last December and then letting FS Tashaun Gipson go in free agency, the Jags will be looking for a starter at either safety position opposite last year’s 3rd-round pick, Ronnie Harrison. In order to keep building the physical team G.M. Bob Quinn is currently constructing, it’s paramount the Lions find some more leaders in their back-seven, and White would be a great addition. If they want to give MLB Jarrad Davis one more season to turn things around though, then maybe they opt for Washington CB Byron Murphy with their top pick instead. Murphy is a physical corner with excellent tackling ability who would also fit in well here. CB – Justin Coleman was signed to replace Nevin Lawson and Rashaan Melvin hopes his reunion with HC Matt Patricia will resurrect his career after a poor season in Oakland. But the Lions need a difference-maker on the outside to line up opposite Darius Slay. And they just might get the chance to select the top corner on their board here at No. 8. DL – Signing Flowers was a really nice move and he should team up with last year’s rookie steal, Da’Shawn Hand, to form a solid talent duo on the edge for years to come. Romeo Okwara chipped in with 7 ½ sacks, but as with every four-man front, pass rush depth is of major importance and the Lions need a bit more of it if they want to be special. WR – Kenny Golladay is coming off a breakthrough season, but the Lions need younger talent to add to this group, especially with FA Danny Amendola turning 34 in November and Marvin Jones coming off a season-ending knee injury. MLB – The Lions should be looking for a talent upgrade in the middle of their defense, as it appears Jarrad Davis has become a major liability there.